Complete sections for 20 villainous organizations, including a power- hungry arcane society, a greedy merchant caravan, a fleet of scandalous pirates, a creepy secret society, and a wily thieves’ guild. Trade blows with the serpentfolk-worshiping monks of Fang Monastery, match wits with the sly bandits of the Merry Outlaws, or defend civilization from the wild druids of Nature’s Scourge! Information on each organization’s history and structure, along with plot hooks to get the players interested in confronting the group. New rules in each villain section, including feats, spells, and magic items. A wide variety of new stat blocks for all organization members, using each villain section’s new rules. Premade encounter groups, allowing Game Masters to quickly make use of the villains in every section. I have all the stat-block books of the RPG line (except from Bestiary 6 =/ ). They are a must to me, as I don't want to expend my time creating foes again and again, and when I do create them, its good to have some examples. There are dozens of NPCs in this book, with all sort of different classes (from hybrid classes to occult classes, or just the classic ones as well).While the classic NPC Codex arranged the many characters in it by "character class", this one arranges them by "Organization". The characters are all built to suit a sort of villainous theme, from evil cultists to secret society members to vile arcane scholars to evil druids. There are even pirates and thieves! Villain codex has new gears, new spells, and some other options - the NPC Codex doesn't. These options to customize the villainous NPCs are also arranged by "Organization". You can also easily rearrange the members of the many Organizations to make new organizations, and the book gives some guidance on how to do this. Like this, you can use this book to insert many different foes in your campaigns "on the fly" (they are all ready-to-go NPCs, just like the NPC codex). Its ease to change their race, some class options, and the flavor, so you can adapt them to any setting or adventure. The main point of the Villain Codex is, as with any "stat-block" book (Bestiary, NPC Codex, Monster Codex), to provide GMs with characters that are ready to be used on the table. There are some of options that can be used by players as well. You can somehow look at the characters in it to see how you would build your own Villainous NPCs, or maybe player can look at them and see how they would develop their characters class build. Many are the ways you can use this book. I have it, and I use it all the time. Unfortunately, I will be taking one star out of the five I wanted to give this book, as I believe we could get more high CR/level villains, to use as really powerful main antagonists in our campaigns. The most powerful ones in the book are CR 14... Powerful, but not so powerful. 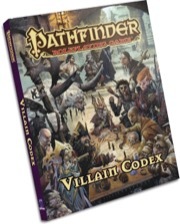 Villain Codex should be called NPC Codex II! Indispensable for GMs. When I first picked up the NPC Codex, I thought it would be what the Villain Codex would eventually become. Conversely, when I picked up the Villain Codex, I thought it would be what the NPC Codex was. Fortunately, both are great books and I may even prefer the Villain Codex as a GM, as it gives us a great selection of generic NPCs that will pop up in a variety of scenarios. Combine this with the NPC selection of the Gamemastery Guide and your GM will have everything they need to bring the NPC faces of their campaign world to life. This book belongs on every Dungeon Master's shelf. As a GM, love it. Good fights to throw at your players abound, and there are even a few new feats / items that may come in handy for players too. This book is not the best put out by Paizo as far as utility goes but it’s also far from the worst. To start with this book is essentially really a DM only book. The format is near identical to the Monster codex which is nice because it’s a familiar format. There are some new magic items and spells and feats and so on but ultimately they are of little use to players and especially little use to good aligned player character. The book is broken up into factions the first page of each faction tells you basically their backstory and evil mo. Then there are about 5-7 pages of “villains” who are part of this faction there are 2 per page and this is sort of where my issue with the book comes in. These NPC villains have no life in them, they have no flavor text about the villain and what makes them tick. This has come up with me a few times in the past especially with bestiary 5. I like the flavor text because it gets the imagination going and helps with coming up with some creative stories or encounters. My example is the Wyrwood in bestiary 4. The description of that monster alone is enough to set the mind racing with ideas for entire campaigns, societies, villains and heroes all from a description that is 2 short paragraphs. This is just lifeless stats over pages and while they are fine for what they are it over all takes away from the book as a whole to me. Also each entry does not have its own image to go along with it. I hope that they remedy this with the pawn set which is supposed to be coming out but I will be making sure I look out for a review on that before purchase I can promise that. I will say that some of the evil organizations are very interesting and things that really you could build entire adventures around and there are handy adventure hooks in the book as well to this effect. Finally at the back of the book are about 2 dozen more organizations with small paragraph descriptions of how they function just to give you some more food for thought which I did appreciate. 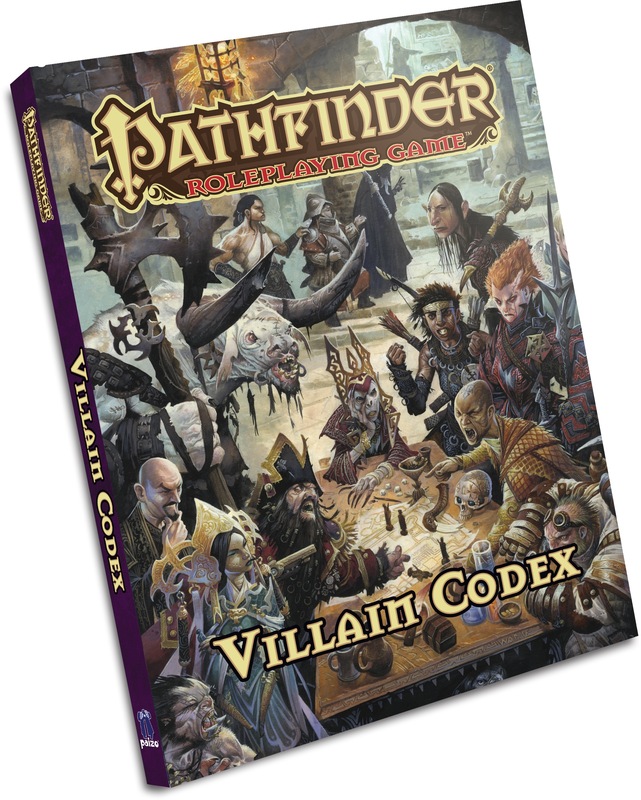 The art that is present in the book as always is beautiful and that is one of the best things about the pathfinder books. They have the best art of any RPG out there. And make no mistake, this, like many of the "Codex" line of RPG books, is a big ol' toybox. It seriously feels like dumping out a massive bin of old-school mix-and-match action figures onto the floor and playing Knights vs. Spacemen, or Cops & Cowboys. This is one of the best possible reasons to buy this book. The groups are all either tried-and-tested fantasy tropes like the mercenary gang, doomsday cultists, douchebag guards, brutal slavors, or tribe of barbarians, possess that flare for reinventing classic fantasy stories that Paizo is so well known for such as the regal court or merry outlaws, or a mix of both, such as the Demon Knights and Death Cult. Want the evil queen from Snow White? They got that. Ever wondered what it would be like if Robin Hood were a jerk? They got that. Felt like tossing in some generic snake-themed ninja bad-guys for that 80's action flick feel? They got that. That having been said, the book isn't perfect. There are two main issues with the book, though I admit that one of them is simply a matter of taste and may not be an issue at all. Firstly, whoever contributed to this book really, really, really loves rangers. Seriously they're everywhere. I understand that they are a fairly easy class to adapt to many villainous roles such as slavor, merc, cultist, tracker, assassin, etc, but it would have been nice to see more variety. Secondly, the book is missing some essential information when it comes to the goodies you can take from it. As an example, the book presents a very fun and flavorful new oracle mystery, but totally misses writing in the final revelation for that mystery, which will hopefully be fixed with the book's second printing. Over all, aside from some small gripes and editing issues this book is great. At least half the fun of these sorts of books is reading about the plot hooks and suggestions for the various villains, and Villain Codex does not disappoint in this regard. As always, the ten dollar price tag for the PDF makes it an even more attractive option as well. This is a definite must-buy for those who like compilation books, are like me and get slightly lazy when it comes to building NPCs, or just want some springboards for generating minor and major story arcs. Now available for preorder! Cover is likely final, but is subject to change. I can't wait for this one. Slavers for the win! My goodness, this sounds useful. The NPC Codex missed the mark as it was organized by class - this sounds much better. Sort of like an expanded version of that, but even more like the way Monster Codex works, but with organizations instead of types of monster. Should be a great way to grab just the stats you need for all the usual villainous groups! I'm kind of psyched about this mostly because while I enjoyed NPC and Monster Codex, it underwhelmed me as a GMing tool due to it's inability to decide if it was "shades of gray" pity the devil type characterization of the NPC builds. This, straight up, gives me what I need: cardboard cut out foes of all shapes and sizes. The carnival troupe sounds interesting. I assume it'll have clowns, it is about villains after all. Probably material that got cut from Horror Adventures. Out of all the announcements from Paizocon, this was one of my least favorite. Considering how freaking awesome everything else was, it only means I was jusp plain happy about it. Honestly a great idea. I eagerly await its release. Oh this is exciting news! Do we get Minotaur Cultists of Baphomet in this? "Premade encounter groups, allowing Game Masters to quickly make use of the villains in each section." This is what I need for when my players suddenly decide to "investigate" areas I haven't detailed yet. Player 1 "Hey, there's probably a thieves guild in this city, right?" Player 2 "That guy we sold some loot to obviously had connections." All Players "We go shake him down, looking to discover the thieves guild's headquarters." How versatile are the different organizations presented regarding there "CR"? I.e. is the merchant caravan only usable for a defined CR/APL or are they scalable (beyond adding/removing mooks)? How easy/difficult will it be to use the different antagonists without the new rules? Just replace some feets and go to town or are there also new mechanics/archetypse, PrCs etc involved? I would say it will be similar in both regards to Monster Codex. What about those Minotaur Cultists of Baphomet, Mister Seifter? Well as you can see from the cover, we've got a minotaur in there. The book is about villainous organizations rather than monsters, though, so don't expect numerous minotaurs or anything. You could probably use the minotaur as part of a Baphomet cult if you wanted, and grab some of the other characters from various organizations. Just wondered if there was such an org in this book, but eh. Demon cultists are a wide bunch anyway. The announcement and product description includes the demon knights organization, so there's definitely going to be demon-worshippers in there! "Demon Knights" sound like the most interesting group, in my opinion. I'm expecting antipaladins or fiendish cavaliers. I just want Deliverer Slayer Minotaurs of Baphomet along with gnoll Iron Tyrants of Lamastu. And you'll probably be right! Thanks, Mark, for your reply. Why not cultists in general? Faith Codex, with stats for members of each of the core deities cults (not just divine casters). And Inner Sea Faith Codex, for members of the minor deities forces. I somehow just found out about this today. Considering how much I adore the NPCs from the Gamemastery Guide, the NPC Codex and Monster Codex, I can't freakin' wait for this. I'll be getting a ton of use out of this in my next campaign, I think. I second the previous question of what sorts of classes are represented in this book. I see a mad scientist-looking guy on the cover, so I'm thinking there's probably stuff beyond the Core Rulebook in here- thus overcoming the only real weakness of the original NPC Codex. 20) and a thieves’ guild." BTW, are we talking about actual evil villains, or just perceived villains? For instance, the "merry outlaws" might be your typical Robin Hood group who steals from the rich to give for the poor. The society that they are preying upon might consider them "villains"... when in hindsight, it's the opposite. Robin Hood was technically speaking a CG character, he wasn't evil per se even if he was stealing from rich people. Cool, more npcs...Wait, villains? What? Uhm not sure that's a complete list. Just a blurb covering what might be in it. Oh yeah, one more thing, I really hope that we get 1 or 2 examples of a good Fighter villain. Long story short: I feel like the fighter doesn't have any feature that make it stand out as a "specific" character. The barbarian has the rage and powers, the cleric has spells and domains, the witch has spells and hexes and the occultist has spells and items. The fighter has... the ability to wield multiple weapons... when technically speaking, a fighter has a primary melee weapon, a primary ranged weapon and a backup weapon... that is if he gets to use them in battle. In short, the fighter relies a lot on his gear to be threatening. As nice as this hardcover sounds, I do hope we get an Advanced NPC Codex or something similar to that as I have need for more pregenerated NPC's than just villains. Changing the Alignment is one of the easiest things to alter about a stat block though. These NPC Codex type books are great. This seems like an extension of the Rival Guide with the inclusion of various rival, or in this case, villainous organizations. Well, I'm hoping we'll get some Codex's for NPC's of the other core classes hopefully. Maybe some of the other core prestige classes as well.